Icon Vehicle Dynamics is one of the highest sought after suspension systems in the 5th Gen world. Along with KING, IVD make a true suspension lift that is a true testament to off-road functionality. Unlike your average spacer lift or canned suspension package, Icons are offered in a wide variety of stages ranging from introductory to highly advanced. With Icon, you have many options to rebuild many components and add to your suspension on the fly. While this suspension lift is not an actual lift kit, is does somewhat act as one being that it is rebuildable and adjustable. With the 3.5″ suspension lift, you just swap out parts like end links, track bars, remote reservoirs, etc. With full lift kits, there is much more involved. Fab Tech/ Dirt Logic and Pro Comp make full lift kits at 6″. How much effort will this Install take? While installing a leveling kit is much easier, they are relatively the same thing. The only difference between installing this stage 2 is that you will be replacing the Upper Control Arms (UCA’s). This does require some extra effort. But, if you read our previous post about the Pro Comp leveling kit, you are familiar with removing coils and that is the bulk of the process. With the Stage 2 extended travel coils and the tubular UCAs, you are looking at a few more hours of work. And yes, it is a bit more advanced but not by much. If you have the right tools to get it done, you will be fine. You can also buy the stage 2 directly from Icon, MetalTech 4×4, Bilsteinlifts.com, SDHQ or a number of other suppliers. There are hundreds of sellers out there that are authorized retailers for Icon. Icon Suspension Lifts Vs. Other Suspension Lifts? The team at IVD made it easy for you to start with an introductory suspension system at around $3000. The only other complete suspension systems that compare to Icon would be KING (in my opinion). Both manufacturers make stunning products that are truly built to last. But, both products perform better under different circumstances and both are made from different materials and manufactured differently. There are many 4Runner and Taco owners out there that claim KING is the best, and that might be, but we are talking Verizon and AT&T here. IVD is known to have slightly more affordable pricing and good customer service; however, that is to be debated as we have not run into an issue. UPDATE (CUSTOMER SERVICE): They sent us the wrong part, for our stage 2. Bummer but it happens. We called 5+ times on Monday, no answer. Sent 3 emails, left two voicemails. Finally, we got a one-sentence email back on Tuesday. The benefit to IVD is that it comes as a complete kit and is tuned for our exact suspension. Even though this kit is supposed to be tuned, it doesn’t feel like that after the install. After you install your Icon Stage 2, your front passenger will sit about 3/4 of an inch lower than the driver. And, IVD does not provide a spanner wrench to adjust your suspension after you install. Nor do they tell you this. You will either need to buy a spanner wrench or take it to an off-road shop and have them tune your suspension for you. To me, that is crazy! With KING, most of their components need to be fine-tuned. When tuned correctly, yeah KING suspensions are known to be the best for sure. With any aftermarket performance suspension, Bilstein Suspension and all others included, you will eventually need to rebuild or replace components as you hammer shocks and struts. It kinda just comes with the territory. Similar to the IVD Stage 1, Stage 2 uses many of the same components. The difference from the IVD Stage 1 to the IVD Stage 2 is the extended travel shocks. Extended travel offers increased wheel travel that will enhance your off-road and on-road performance. Because of the extended travel, the IVD Stage 2 requires Upper Control Arms (UCA’s). You can buy the billet aluminum UCAs but they are a bit more expensive and offer very similar functionality. We chose the tubular UCAs as they are somewhat similar in terms of performance but are much more affordable. By going with a performance UCA, you will have better articulation and much more strength as opposed to the OE UCA’s. Also, the Icon UCA’s have alignment correction built-in. Icon recommends running the #56100 shock shin guards or any other shock boot to reduce the chance of shock damage. The front coilover shocks of the IVD system are located in a “vulnerable position” that may allow debris to make direct contact with the shock shaft. (KDSS! ): KDSS requires 54200 rear adjustable track bar (But, do they really?). NO. There are many owners that are not running the 54200 track bar and have no problems at all. If you plan on having flexed-out Friday’s every Friday, then you might want to get the track bar. If you are fully flexed out, you will notice why IVD recommends that you run the track bar. But, you should be fine without it. We will install our suspension and then probably order the Track Bar, and install at a later point. 34″+ Tires: They will fit but rubbing is possible. (Fender Mods and Body Mount Chop might be needed). The 34″ tire question with stage 2 icon lift is a bit of a tricky question. Some guys say they run it just fine with no rubbing and some have had to make drastic changes to their frame, body and fender liners. We have 285/75R17s (33.8″ tires) on our 4Runner and we had lots of rubbing. We wrote a pretty good overview of trimming the wheel well and other areas for fitting larger tires. You should check that post out if you are looking for bigger tires. The extended travel coils (2.5″ Shocks = 3.5″ of Front Lift) are a step above the Stage 1. The biggest difference in the two coilovers is the actual travel or length of the actual strut and coil. In terms of actual up-travel and down travel for these shocks, you are looking about 1″. The extended travel coilovers offer 1″ of extra droop. Doesn’t seem like much but 1″ makes a huge difference in many areas of life. Being that the actual coilover is 1″ longer really means you have 2″ of extended travel when measured at the wheel. So yes, the extended travel coils are worth it and they provide a noticeable difference if you are paying attention and care about all of the details in your suspension lift. By upgrading your suspension to an aftermarket rebuildable suspension, you are technically getting your caster and camber out of spec. When purchasing a new suspension system, you have the option to stick with your OE Upper Control Arms (UCAs) or going with aftermarket UCAs. Most of the time, if not always, it is a good idea to get aftermarket UCAs with your suspension lift to account for correct caster (more adjustments). If you have low caster, you may have bad alignment and consistently make trips to the service center when all you really needed was a pair of performance UCAs. If you are running stock UCAs, you just run the risk of wearing them out after awhile, if you are running a 2.5-3.5″ lift. The 52700 rear springs that are included with the stage 2 are go-to when it comes to rear springs. These springs will help with load bearing in the rear and are guaranteed to never sag. That is saying a lot coming from an industry where many coils and springs are prone to sagging. You can also buy a 3″ overland spring if you plan on going higher in the front or plan on weighing down the back. When mounted with the 1-3″ rear 2.0 aluminum series IR shocks, the support on-road and off-road is unmatched in terms of feel and performance. The rear shocks are just that. In terms of this whole suspension system, the rear shocks without remote reservoirs are kind of basic. We will eventually go with remote reservoirs so the shocks last longer but we will see what happens down the road and go from there. These shocks are incredibly well made but what is so different about these shocks compared to others? There are many other shocks like Bilstein and Fox that are comparable but do they offer as much dependability? Dependable is all subjective here as it depends on the type of terrain you are putting your shocks through. All aftermarket rear shocks are going to be replaced or serviced one day. With that being said ICON and KING again are some of the best. If you are looking for the best of the best either option would probably work. Why did you choose the IVD UCA over SPC? I am having a hard time choosing which UCA to use on the the IVD stage 2 system. I have a 2018 4runner off-road premium with 285 70-17 KO2 right now. I appreciate your feedback. Would you still choose IVD over King? Kinda swayed by King right now, but not in a rush to decide. Thanks for your thoughts. Hard to say, at the end of the day KING is a little more expensive but everyone is pretty much sold on them at this point. I am going to buy a set of KINGS and do a back to back comparison of both suspensions KING vs. ICON once I feel them out. I have been mostly happy with Icon aside from their customer service. If you buy a set, just buy them from Metal Tech 4×4, not Icon directly. I have heard common complaints about people going 9-12 months and then experiencing leaking and needing rebuild. Icon will warranty them, but your truck would be down for a few weeks and you need to pay shipping (at least that’s what happened to a buddy of mine). I might go KING if I could go back, who knows. Good luck. I would recommend Bilstein 6112/5100 kit we installed on my second 4Runner. That was a great budget-friendly, dependable lift kit. 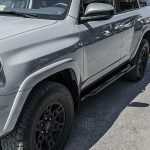 What if you want to do a higher quality lift kit than the Bilsteins, but want to be slightly above stock ride height, like around 2″ instead of 3″? Any suggestions? Seems like most legit lifts are are 3″. I’ve been looking at Icon, but am also concerned about having to rebuild suspension soon and not having great customer service. You can adjust Icon coils to 2″, they are just rated to max out at 3.5″ which is why they are advertised like that. Icon coilovers are fully adjustable and can be adjusted down to the top thread (lowest ride height) if you wanted. I am not sure exactly where that would put you, but you get the point. If you wanted a 2″ lift in the front, you would need a .75″ coil for the rear. I am not sure who has a .75″ or 1″ coil to level out (maybe Dobinsons). If you want a 2.5″ lift in the front, you would want a 1″ spring for the rear to level the truck. Icon doesn’t have great customer service by any means but the guys at Metal Tech 4×4 do, you count on them to answer the phone for sure. Thanks! I just pulled the trigger on an Icon Stage 2 kit. SDHQ had it for a couple hundred cheaper than Metal Tech and icon themselves… The Cyber Monday deal was about to run out, so couldn’t check on price matching, etc. Hoping they let me swap out the front 650# coilover for a 700# coilover. And will be on the lookout for a 1 inch spring for the rear. Good thing is I’ll have the capability and the spring needed to go up to 3.5 inches if I want to later on.